Mbombela Stadium is a new 43,500-seat stadium and is one of the ten venues for the FIFA World Cup 2010. It is located on open land six kilometers west of Nelspruit, South Africa, with the stadium as the centrepiece of a proposed sports precinct with athletics and cricket as well as other sporting codes. Construction commenced in February 2007 with a completion date of Oct 2009. The Construction contract was awarded to a South African–French consortium. Most of the seats are covered by a cantilever roof. The signature feature of the stadium are the 18 roof supports that resemble giraffes. The stadium is close to the Kruger National Park so it is apt that the stadium reflect this inter-relation. Visitors to this World Cup venue will be able to couple this with a visit to the game reserve. 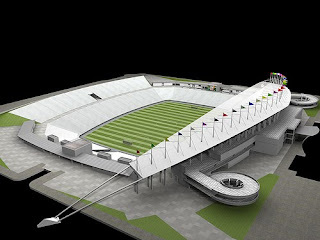 The R1,050-million sports facility set to be ready for use in 2010 well ahead of the June 2010 World Cup kickoff and has been made possible through taxpayer funding.